1 Put the game board on the table. Leave some free space next to it for the card rows. 2 Randomly distribute the 6 round tiles face-up among the 6 districts. 3 Put the gondola tiles on the gondola space. 4 Shuffle the bridge tiles face-down and put them in a stack. Put this stack face-up on the bridge space such that only the topmost tile is visible. 5 Put the bonus tiles indicating the district bonuses on the bonus spaces on each side of the Grand Canal. 6 Sort the building tiles by color and value and put them on the building spaces. 7 Put the gold coins as indicated on the game board. 8 Thoroughly shuffle all the cards and put them face- down in a stack next to the game board. 9 Randomly determine a starting player. 10 Each player takes 1 player board and the counters of his color. 11Beginning with the player to the right of the starting player and in counter-clockwise order, each player puts one counter on the first space of the Doge track. 12 Each player puts the other counter on space "3" of the Victory point track in any order. 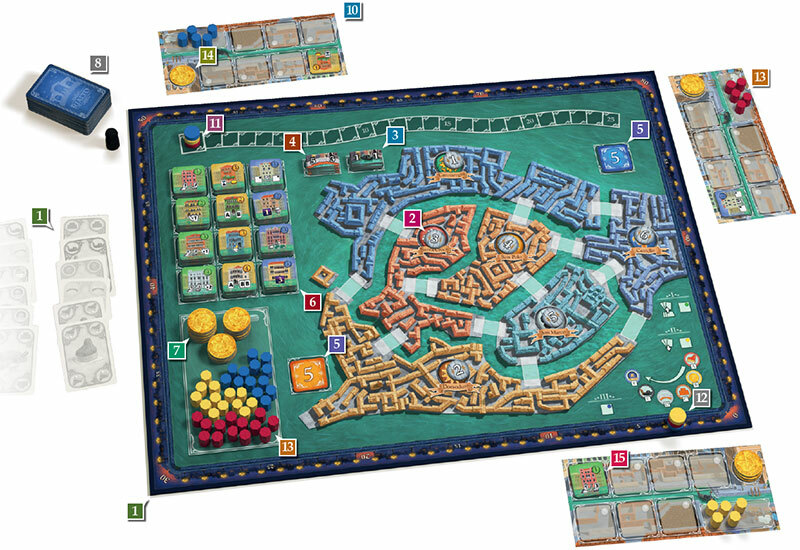 13 Each player puts 5 of his councilmen on his player board (personal supply) and the remaining ones as indicated on the game board (general supply). 15 Starting buildings: Beginning with the player to the right of the starting player and in counter-clockwise order, each player chooses and takes one building of value 1.
in a 4- or 5-player game no more than 2 players may take the same building. The Doge track indicates the players' influence on the Doge. The game is played over 6 rounds with each round consisting of 3 phases. In each such phase, buildings of a certain color may be activated for their special abilities. To activate a special ability, a player needs to put one coin from his supply on one of his available buildings. Phase II: The players play their cards over 6 stages to carry out actions A-F. They can activate yellow buildings to support these actions. Phase III: Players can activate blue buildings to gain those buildings' benefits. Move it into the district of the current round. The order the districts are played through is defined by the round tiles (in round 1, put the district token on tile 1, etc).. Note: This is the district to which Councilmen will be assigned during this round (see p. 5-F). 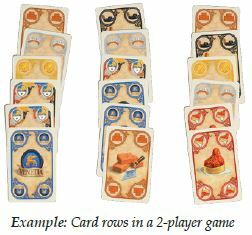 Lay out a number of card rows next to the game board, each consisting of 6 face-up cards, equal to one more than the number of players. The card icons need to be clearly visible. Note: For a better card distribution place one card per row at a time. When the draw pile is empty, thoroughly shuffle all the discarded cards to form a new draw pile. and his leftover cards from the previous round (if any) into his hand. 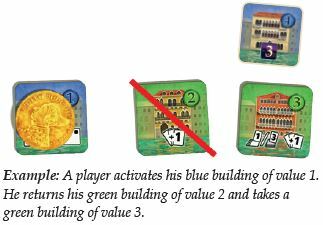 Players may get more cards via green buildings (see p. 8). Each player may only keep 7 cards for the next phase and has to discard any extra cards. Some green buildings may increase this number when activated. Each player has to keep their own, face-down discard pile (this avoids confusion with the draw pile and simplifies shuffling later on). This phase goes through 6 stages (A - F). In each such stage, players may play cards of a specific type and add Jokers if needed. Each type of card corresponds to a specific action. In the first stage (A), the player furthest ahead on the Doge track is the starting player. In each of the following 5 stages, the starting player will be the player who got the bonus in the previous stage. Note: If in any of these stages nobody plays any cards, the starting player does not change in the next stage. Beginning with the starting player and in clockwise order, each player gets a single turn to play any number of cards matching the cur- rent stage. A player does not need to play as many cards as possible - he may even play none at all and simply pass. He may keep leftover cards for the next round. Each player may carry out actions according to the number of cards he played. The player who has played the most cards gets a bonus in addition to his actions. The bonus will not be awarded if nobody plays any cards. In this phase, players can activate their yellow buildings. 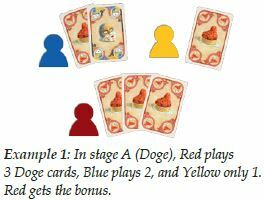 The Doge track breaks any ties for the number of cards played and defines play order when carrying out actions (see p. 2). At the end of each stage, each player puts his played cards face-down on his discard pile. Each player's hand size needs to be clearly visible at all times. In the order indicated by the Doge track, each player advances 1 space on the Doge track per card played. If a counter enters an already occupied space, it is put on top of the other counters. Bonus for most cards played: The player advances 1 additional space on the Doge track when moving his counter. 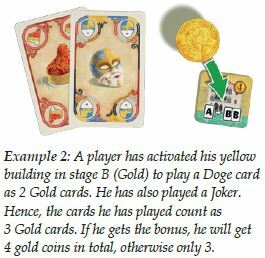 For each card played, that player collects 1 Gold coin from the general supply and puts it on the designated space of his player board. Bonus for most cards played: The player gets 1 more gold coin. Each player may choose a building with a value equal to or lower than the number of cards played. He then puts the building on a free space of his player board. A player may have any number of the same type of building. Bonus for most cards played: The player adds +1 to the number of cards played. Per card played each player gets 1 victory point. Players who did not play any Bridge cards lose 1 victory point. 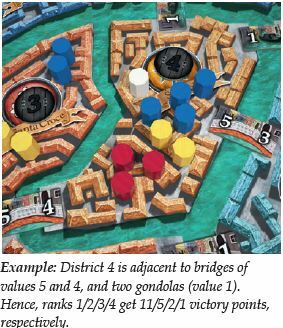 Bonus for most cards played: The player gets 1 more victory point and places the next bridge tile on a free connection between two districts. He may decide how to orient the bridge. For each card played, that player moves 1 of his councilman from the general supply to his personal supply. If a player has no more councilmen in the general supply, he gets 1 victory point per missing councilman instead. 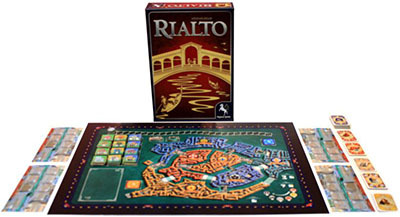 Bonus for most cards played: The player places a gondola tile on a free connection between two districts. He then puts 1 of his councilmen from the general supply into one of these two districts. If the player has no more councilmen in the general supply, he gets 1 victory point instead and may use a councilman from his personal supply or from a district. 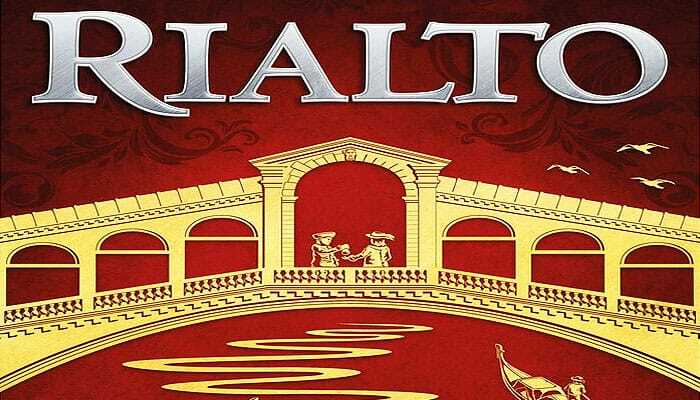 District bonus: The first player to have at least one of his councilmen in each of the three districts on one side of the Grand Canal, immediately gets 5 victory points and turns the corresponding bonus tile face-down. For each card played, that player moves 1 of his councilmen from his personal supply to the current district. If a player has no more council- men in his personal supply, he may move councilmen that he has already placed on the board. Bonus for most cards played: The player puts 1 more councilman into the current district. District bonus: See E: If more than one player happens to accomplish this during the same stage F, each one of them gets the bonus. A player may add one or more Jokers to cards played in phase II. He cannot play a Joker on its own. However, if a player has no cards of the required type, he may play 2 Jokers instead, but they only count as 1 card of the required type! He may then add further Jokers per usual. Blue buildings can only be activated in this phase. As usual, they are activated by putting a coin on them. Remove the coins from activated buildings and return them to the general supply. The game ends at the end of round 6 with a final scoring. Each player gets a number of victory points equal to half of the total number of leftover councilmen and coins in his personal supply (rounded up). Each player gets victory points for his buildings according to their values. Finally, there is a scoring in each district. Rank 1: total value of all adjacent bridge and gondola tiles. Rank 2: half of the value of rank 1 (rounded down). Rank 3: half of the value of rank 2 (rounded down). etc. (no points for a player with no councilmen in the district) Note: To keep track of which districts have already been scored, remove the councilmen from an already scored district or turn its round tile face-down or remove it from the board. Ties are broken by the Doge track.